Over the past few years, I have had many questions dealing with keeping sponges in reef aquaria, and thus far, my general impression is that few aquarists have success with these odd animals. I have gotten a couple of questions about sponges recently, and decided it was time to write an updated article about them. I think that there are really two primary reasons for the unfortunate failure of most hobbyists with sponges in their aquaria. The first reason is that most collectors and hobbyists are ignorant of sponge biology, and do not realize that removing most reef sponges from the water, even for several seconds, will kill them (I will explain this in more detail below). Second, very little is known about sponges even within the scientific community, and their physical tolerances and husbandry requirements remain as much a mystery to marine biologists as they are to reefkeepers. For example, there is an ongoing debate among sponge biologists concerning the factors controlling sponge distribution in the wild. Some researchers contend that the many sponge species found primarily or exclusively in reef areas are excluded from mangrove habitats by physical tolerances and/or seastar predation (e.g., Wulff 1995). Other researchers have shown that transplanted sponges from the mangrove habitat are consumed by predatory fishes on the reef within hours of being moved, and suggest that, because sponges moved in cages seem to survive perfectly well, predation pressure by reef fishes must limit the range of these sponges to mangrove habitats (e.g., Chanas and Pawlik 1999; Dunlap and Pawlik 1996; Pawlik 1999). Given that marine biologists studying these animals cannot currently agree on an unambiguous answer to explain how and why these animals live where they do, it is not surprising that reefkeepers have highly variable success at keeping sponges in captivity. 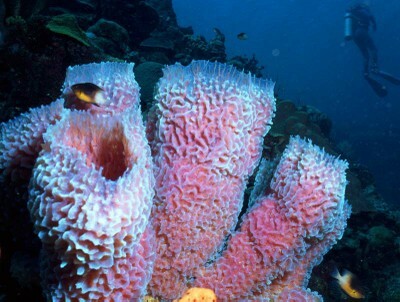 In fact, given our ignorance of sponge biology, it is surprising how successful many people are keeping these animals! They are remarkably hardy and adaptive, if healthy, and many not only survive in reef tanks, but can even grow well and reproduce. Of course, some species are substantially easier to keep than others, but most species of sponges are likely to survive in a well established and maintained reef aquarium if we understand their needs. I cannot give specific details for many taxa in this article, and will simply try to explain how I select and introduce sponges into my own reef tanks. First, always select a sponge that has a uniform consistency. By consistency, I mean that there are no dead, dying or discolored sections of the body. You should not see any `fuzzy’ regions, or clear spots anywhere on the sponge. I did not say select a sponge with uniform color because many healthy sponges may display different color patterns on different body regions; if you are unfamiliar with selecting sponges, however, it is best to avoid ones that have variable colors, because you may not be able to differentiate an unhealthy sponge from one that is simply mottled. Second, make sure that the sponge goes into a tank with the same relative environment as the one from which it is collected. Sponges from protected environments have different requirements than those collected from a fore-reef habitat. For an extreme example, if you see that a sponge is growing well in a protected and darkened corner of your dealer’s tank behind the live rock, do not stick it into the middle of yourhigh-flow reef tank under 500W halides and expect it to do as well. If neither you nor your retailer have any idea of the habitat from which the sponge was collected, you are better off not buying the animal, because chances are low that it will survive the transition into your tank. Finally, make sure that the sponge never leaves the water when you are moving it. Although there are many species of intertidal sponges which are stranded in the air each time the tide goes out, reef sponges are not among them. Although there are many intertidal sponges out there, I have yet to see many in the reef trade, and the chances are high that any sponge you see for sale in the hobby is an obligate reef sponge that will not tolerate being out of water for any length of time. Personally, these days I use a drip acclimation method for most of my animals in order to minimize the stress of transition into my aquarium. After floating my new arrivals in the tank for a few minutes to equalize the temperature, I move them to a large bucket and prop the bag up while I drip water from my tank into the bag at about 2 drops per second. In the case of a sponge, when the bucket is close to full, I use a Ziplock bag to seal the animal with a small volume of water (done completely underwater without any air in the bag at all), and transfer the animal along with a minimal amount of seawater into my tank, making sure the bag is completely underwater before releasing the animal and placing it where I think it will do best. 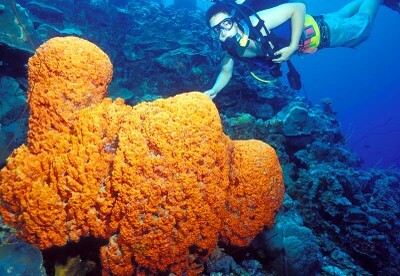 Particularly hardy reef sponges which are well suited for the novice and nervous include Callyspongia vaginalis (Lavender tube sponge, typically with Parazoanthus throughout the body wall), Chondrilla nucula (Chicken-liversponge), Cliona delitrix (Red boring sponge), and Cinachyra kuekenthali (Orange ball sponge). OK, this is probably an aside for most people, but I always try to explain the biology of the animals I am writing about in each article, and I think it is important for people to know something about the biology in order to give their animals the highest chance of survival in captivity. A sponge is the common name for members of the phylum Porifera, which has about 5,500 currently described species (Brusca and Brusca 2003). Some sponges can grow to more than 6ft in height, and can make up a substantial portion of the total biomass in some habitats. Tropical reef habitats house the richest diversity of sponge species, but sponges can account for up to 75% of the total animal biomass on the Antarctic sea floor (Brusca and Brusca 2003). Traditionally there were four classes of sponges defined primarily on the basis of the skeletal elements, although this has recently been reduced to three, and some debate remains about the validity of even these three classes (Vacelet 1985). The first group, Class Calcarea, is entirely marine, and produces spicules of calcium carbonate which are laid down entirely as calcite. Although these sponges are not particularly common or obvious in the wild, they are interesting to reefkeepers because they are one of the most common to be found in reef tanks. They generally occur between pieces of live rock and in sumps or overflows in virtually every tank seeded with live rock. There are several common species, all small (usually about the size of a rice grain) and often with a very fine, funnel-like extension on one end (e.g., Leucilla, Leucandra, Scypha = Sycon, Clathrina, etc.). The second class, Hexactinellida — better known as the glass sponges — is also entirely marine. These sponges produce spicules made of silica, and although beautiful, are almost entirely deep-water species unsuitable for aquaria. The only specimen of this class anyone reading this article is likely to have ever seen is Euplectella aspergillum, the Venus’s flower basket. This sponge has become popular as a collectors’ item, but was traditionally given as a wedding gift in some Asian cultures because there are symbiotic shrimp which colonize the sponge as larvae, and then become trapped within as they grow. These shrimp ( Spongicola ) form mated male-female pairs, and the ‘lovers imprisoned within the sponge,’ I am told, is considered a good luck gift for the betrothed as a symbol of the lifetime bond between the two partners. The final class is the Demospongiae (for readers following the incorrect taxonomy presented in texts, such as Moe (1992) or Haywood & Wells (1989), this is the class which largely absorbed the Sclerospongiae, although some were discovered to be Calcarea, as well – see Brusca & Brusca 2003). Demosponges are the animals everyone thinks of when you hear the word “sponge.” They typically have siliceous spicules, and often supplement or replace the silica-based skeleton with a collagenous network referred to as ‘spongin’ (this is the material of which your authentic bath sponge is composed). The Demosponges are found in marine, brackish and freshwater, and at all depths. This classification becomes more complicated and confusing, however, by the introduction of an archaic system of classification by ‘body type.’ There are three basic body types among the sponges: asconoid, synconoid and leuconoid (in that order) levels of organizational complexity. Rather than getting into allsorts of technical details about these definitions, let me just say that they have no basis for classification (they simply refer to how the body is designed and how water travels through the sponge), and all three classes have sponges with all three levels of complexity. If you really care what the differences are, go to the library and take out a good invertebrate zoology textbook like Ruppert & Barnes (1994) or Brusca & Brusca (2003). There are two basic attributes that are shared by all sponges: their water current channels (aquiferous system) and the totipotent nature of sponge cells (ability to revert to an immature state and become a new cell type. This is a very unusual characteristic in animal cells – for an extreme example, if we had totipotent cells, a cell from our tongue could become an undifferentiated cell and travel through our bloodstream to replace a damaged eye or brain cell). In fact, some sponges are so good at this that they can reform after being mashed up, squeezed through a cheesecloth mesh, and poured into a beaker of seawater. People have even done this experiment with two different kinds of sponges, and have them sort themselves out of the mix to reform two distinct little sponges from the puree. The aquiferous system is just as amazing: an individual Leucandria 10 cm long and about the diameter of a pencil pumps 22.5 liters (about 5.5 gallons) of water through it’s body every day. 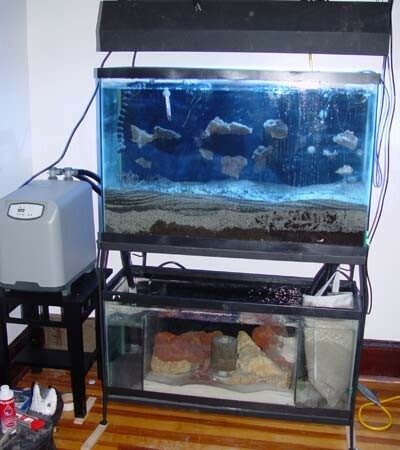 The impressive sieving capacity of even a relatively small sponge is what has led some to champion their use as natural filters for reef aquaria (Tyree 2003). There is no doubt that sponges can filter a surprising amount of water through their bodies on a daily basis. This pumping capacity is even more amazing when you realize that the cells responsible for moving this water (choanocytes) are about the size of our white blood cells. Aggregations of several hundred of these cells form chambers, and these choanocyte chambers may be as dense as 18,000 per cubic millimeter in complex sponges. Each cell has a tiny hair (flagellum) surrounded by a collar made of other even smaller hairs (microvilli). The flagellum waves back and forth from base to tip, pushing water ahead of them as they do.Each cell beats at it’s own pace, and pulls water from very tiny openings (ostia) all over the surface of the sponge (the largest of which are about 1/10th of a millimeter) into the sponge, along the cell body, through the collar which captures food particles from 0.1-1.5 μm (that’s less than 1/600th of a millimeter — about the size of a bacterium), and pushes the water away from itself towards a common exhaust system (the oscula). As water moves along the cell body, oxygen diffuses into the cell, while carbon dioxide and other wastes diffuse out of the cell into the ‘exhaled’ water. Some free cells (ameobocytes) cruise around through these water channels and ingest small algal cells, protozoans, detritus and other organic particles in the range of 2-5 μm. Other freely moving cells (archeocytes) take these captured particles and complete the digestion of them before passing nutrients along to the rest of the body. Dissolved organic matter (DOM) is extremely important to the nutritionof many sponges; for example, studies on three species of Jamaican sponges showed that 80% of organic matter taken up by sponges was below the resolvability of microscopy, while the other 20% was comparised primarily of bacteria and dinoflagellates (H.M. Reiswig, unpublished data, from (Reiswig 1975). That is not to say that all sponges require the same types of tiny particles, bacteria or dissolved organic matter to thrive. Some sponges are almost entirely dependent on photosynthetic symbionts to produce their nutritional requirements. For example, Wilkinson (1983) showed that six of the ten most common sponges species on the Great Barrier Reef (GBR) are primary producers rather than consumers. In fact, these sponges are more similar to plants in terms of their requirements in the aquarium than animals; they actually produce three times more oxygen through photosynthesis of their symbionts than they use in respiration! For species such as these, the availability of light for their symbionts will be of much greater importance to survival in the aquarium than the presence of any given particulate food. Other sponges are actually predatory on large prey items, having dietary requirements more along the lines of fish than a typical sponge. The amazing sponge Asbestoplumais capable of capturing, swallowing and digesting mysid shrimps (Vacelet and Boury-Esnault 1995). 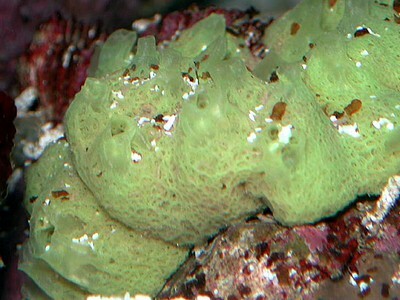 In fact, one could argue that the diversity of feeding modes among the sponges is greater than that of any other group brought into the aquarium trade: some are completely autotrophic (self-supporting through photosynthesis), some filter only a narrow range of specific-sized particles from the water column (such as bacteria or phytoplankton), some subsist almost entirely on dissolved organic matter absorbed from the aquarium water, and some capture and ingest live prey. Surprising habitat specificity was demonstrated by a study that examined the effects of transplanting sponges to different conditions of light and current on natural reefs (Wilkinson and Vacelet 1979). For species with obligate (always present) symbionts (e.g., Verongia aerophoba ) growth was enhanced by high light levels, whereas growth of species that always lack symbionts (e.g., Chondrosia reniformis )was often inhibited by strong lighting (Wilkinson and Vacelet 1979). Species which had facultative symbionts (may or may not have symbionts present), such as Chondrilla nucula and Petrosia ficiformis did not appear to be affected by the light regime, and did equally well in bright and subdued lighting (Wilkinson and Vacelet 1979). The majority of sponges brought into the aquarium trade, however, are going to fall into the category of small-particle suspension feeders. These animals actively pump water through their body and sieve out the tasty particles of appropriate size, and/or absorb dissolved organic material from the water passing through their body. They get a hand in transporting water through their bodies by oceanic water currents around them and something called the Bernoulli Principle. Basically, when water or air flows over a smooth surface, and then hits something that is raised, it creates suction at the raised area. If you look closely at a living sponge, typically you see a more- or-less flat surface with a few raised holes in it — these are the oscula (exhaust system). As water flows across the surface of the sponge, the lift generated by flowing over the raised holes leads to suction pulling water through the aquiferous system and giving the choanocytes (water-pumping cells mentionedabove) a helping hand. However, the sponge builds the bumps on its surface to specific sizes and diameters under certain flow regimes, and changing the amount or direction of flow over those bumps can lead to them not really working so that wastes and oxygen cannot be efficiently exchanged – or worse yet, water being forced back into the holes. The reason that removing sponges from the water typically proves lethal to these animals has to do with these mechanisms of water transport. If you remove the sponge from the water, airlocks often form in the channels of the aquiferous system, and with only a flagellum to move water, there is no way to force that air out of their body. The choanocytes soon die, and that leads to a general necrosis in the area, typically proving fatal. This may sound ridiculous to you, but consider yourself as a choanocyte. I give you a jump- rope to move water over yourself and gather food and exchange wastes (this sounds silly, but it’s basically to scale). You’re sitting there whipping your skipping-rope back and forth to push water through the pipeline in which you live, when the water flow is cut off and your pipe drains. Your pipe is at an odd angle, such that when the water is turned back on, you’re trapped in a bubble. Think you can swing that skipping-rope back-and-forth hard enough to pushthe air out of your pipe? It essentially works the same way for the sponge. That trapped air causes those cells in the area to die, and as they decompose, they produce gas which makes the problem worse, and the sponge starts to decay right before your eyes… The best way to deal with a dying area in your sponge is to cut that portion of the animal away and discard it. Although this sounds a little extreme, it will greatly increase the chance of survival for your animal if you can cut away the sickly region and leave only healthy tissue behind. However, assuming that the sponge was collected and shipped properly, the fact that we know nothing about the habitat or conditions under which it was originally collected does not doom the sponge. Contrary to popular belief, sponges are capable of moving, and if they are unhappy, they can slowly (on the order of 0.5 cm per day) reorganize themselves, change the shape and size of their oscula to match changed flow conditions, or even slide across the bottom to find a place they prefer to live. It takes a great deal of energy for a sponge to be able to move, and the animal simply cannot afford that energy if it is not healthy in the first place. That they can move and thrive assumes, of course, that they are completely healthy and water conditions are otherwise ideal for them (which is often not the case when the animals are imported for the hobby). The ability of a sponge to tune its body shape to the new conditions (flow, lighting, food availability, etc.) under which it finditself in our aquaria requires that the animal be in excellent condition when first introduced, and the tank has an acceptable habitat for the sponge once it gets settled into its new home. 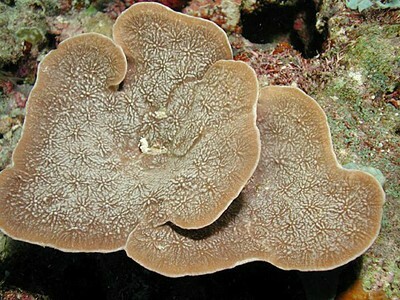 Without both of these conditions, you are sure to fail with most animals that could be added to a reef tank! One of the best ways to get started with a sponge in your reef is to find a local hobbyist who has something that is doing well in their tank, and get a cutting to try on your own. This way, you’ll know exactly what kind of conditions the sponge was thriving under when you get it, and can try to place the new cutting in the location in your own tank that most closely matches the conditions under which it was previously growing. All sponges appear to be capable of sexual reproduction and typically also exhibit one or more forms of asexual reproduction. Sponges are hermaphroditic, but typically produce eggs and sperm at different times. In terms of methods of reproduction, “sponges probably win the prize for variety” (Brusca and Brusca 2003). Common methods of asexual reproduction include regeneration from fragments, budding, and possibly asexual production of larvae (although this possibility still remains contentious). Once larvae are formed (whether this would occur by sexual orasexual production), they are usually released through the excurrent water flow, or may also rupture out of the body wall. Sponge larvae are typically free swimming, all are non-feeding, and after a short period of swimming or grubbing about on the sea floor, these larvae attach to the substrate and metamorphose into tiny sponges. Given this mode of reproduction, sponges are among those reef invertebrates likely to be successfully reared in captivity if we can induce them to reproduce predictably. However, even if we could get sponges to spawn reliably in captivity, growth rates are highly variable among different species of sponges. In general, tropical reef Demosponges probably live on average from 20 to 100 years (Brusca and Brusca 2003), and for the slower-growing species, it would take a considerable amount of time for a sponge recruit to grow to a size at which they could be sold or traded. Some sponges, like Callispongia vaginalis (lavender tube sponge) grow so quickly one can notice differences within a week. One sponge, Terpios from Guam, grows an average of 2.3 cm per month! Others, like Xestospongia muta (tub or barrel sponge) grow so slowly that no difference can be seen in the sponge from one year to the next; these sponges obviously grow, however, since some of them are large enough for an adult SCUBA diver to climb into and hide. Depending on the species of sponge, and the average growth rate of those animals, the likelihood of beingable to spawn them in captivity for trade is highly variable. A corollary of this variable growth rate is the impact that hobby collection has on the natural population. Collection of a common, fast-growing species will tend to have much less impact on natural populations than harvest of a very slow-growing species that takes decades to reach reproductive maturity. In addition, research with caged sponges suggests that the faster-growing species tend to have increased survival and growth rates after transplantation to new sites (e.g., Pawlik 1998; Wulff 1997). These results together with the potential ecological impact of hobby collecting argue for avoiding the slow-growing sponge species for our tanks; obviously we would all prefer to select species that will thrive in our tanks and have a minimal impact on the natural reefs rather than support trade in animals that have a low chance of survival or a dramatic impact on natural reefs. 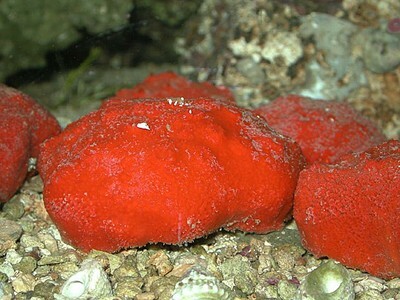 Sponges are highly variable in color, and almost every color possible is found within the group, ranging from white to black, with many brilliant shades of red, orange, yellow and even blue in between. The pigments responsible for the color of the sponges appear to be derived from a number of sources, including de novo synthesis, translocation of pigments from food particles and symbiotic bacteria and/or algae. Some texts (Tyree 2003) have attributed the bright colors of many sponges as a warning to potential predators, and suggest that drab colored sponges are therefore safer for the reef aquarium than brilliantly colored ones. Tyree has an entire discussion of which sponges are members of the “cryptofauna” and the importance of choosing drab sponges from this functional group. Haywood and Wells (1989) even go so far as to suggest color may provide an indicator of preferred depth, with dull sponges collected from deep sites and colorful sponges collected from shallowones. Put in the simplest terms, there is no scientific evidence to support either claim. 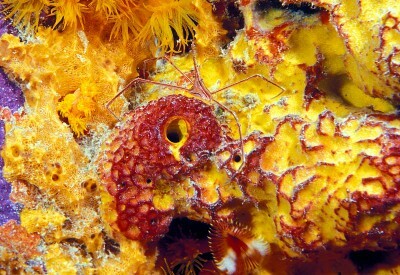 Many colorful sponges are undefended by antipredatory chemicals (e.g., Callispongia vaginalis ), while many dull species are heavily defended (e.g., Neofibularia nolitangere – the “touch-me-not” sponge, which causes severe contact dermatitis in most humans), and vice-versa (Pawlik et al. 1995). Likewise, there is no pattern of greater defenses in sponges from different habitats or geographical locations (such as the tropics versus temperate oceans) for either physical or chemical defenses (Becerro et al. 2003; Burns et al. 2003; Burns and Ilan 2003). Researchers have argued that ubiquitous chemical defenses are an effective defense against many scavengers, generalist predators and perhaps even other invertebrates seeking to settle and grow on the sponge, and are therefore a critical component of the life history of all living sponges (Becerro et al. 2003). 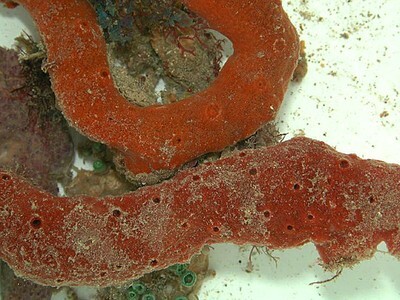 However, despite the presence of these potent chemical defenses, some sea slugs, polychaete worms, seaturtles and fishes have managed to find a way around the nasty toxins produced by many of the tropical sponges, and not only eat them, but some even specialize on sponge diets (Pawlik 1999). Furthermore, research has shown that fish attack transplanted sponges on natural reefs without any regard for their color (Dunlap and Pawlik 1996). Of 35,301 bites recorded during this study, 50.8% of bites were taken by angelfish, 34.8% by parrotfish, and 13.7% by trunkfish and filefish. In these paired transplants of similarly-colored sponges from reef and mangrove habitats, fishes preferentially ate the mangrove sponges of all colors while avoiding similarly-colored sponges found naturally on the reef placed directly beside them in the transplant array (Dunlap and Pawlik 1996). Likewise, there is no evidence to support the claim that dull sponges come from deeper depths than brightly colored ones (Pawlik et al. 1995). For exampled, I have collected the beautiful scarlet sponge Clionadelitrix and the more variable Aplysina lacunosa – ranging from bright yellow to pink to lavender to rusty red – at depths of 180 ft. At that depth, everything pretty much looks black without the aid of a dive light. This discussion highlights an interesting point that I believe was the reason for these erroneous claims: many chemically defended sponges are simply unsuitable for reef tanks because their antipredatory chemistry adversely affects not only predators, but potentially also tankmates and even reefkeepers as well. For example, the fire sponge, Tedania ignis has such potent defensive chemicals that after simply putting my arm into the tank in which this sponge was kept my arm turned red and appeared (and felt) badly sun burned wherever it had been in contact with the tank water — even though this was a flow-through system (i.e., we pump water in from the ocean on one side of the tank, and out back into the ocean on the other)! Few sponges have this potent an effect (hence the common name), and it may be that I am more sensitive to these animals than the average, but it is worth noting that some sponge species (e.g., T. ignis and N.nolitangere ) can elicit very painful reactions if handled by people. Other potentially undesirable sponges include species like Siphonodictyon which use a type of ‘chemical warfare’ to prevent crowding from scleractinians by exuding a toxic mucus from their oscula which kills coral polyps on contact. Obviously, this sponge should not be high on the list of potential aquarium species for anyone who wants to maintain corals in their aquarium. Another example, the boring sponge Cliona, although not often attacking live corals, do often hollow entire pieces of live rock as they grow. Over time, this sponge can hollow the entire coral head to the point that the live tissue forms only a weak crust surrounding the sponge which could collapse with any pressure, and colonies of this stage are particularly vulnerable. Again, this is not a great choice for a reef aquarium. The sponge Terpios, mentioned for it’s extremely fast growth above, produces some toxinswhich appear to kill algae, clams, hydrocorals, and even molluscs prior to contact, allowing the sponge to overgrow potential competitors for space on the reef (Brusca and Brusca 2003). Sponges are, in fact, the most chemically rich group of animals discovered to date (Pawlik 1999), and some predict that the majority of new pharmaceuticals discovered over the next decade or so will be isolated from marine sponges. Halichondria moorei, for example has long been used by New Zealand natives to aid healing. Recent chemical analysis of the sponge discovered that nearly 10% of the sponge weight is composed of the potent anti-inflammatory drug potassium fluorosilicate. Even though the Maori didn’t know what the compound itself was, they quickly learned that the use of this sponge had amazing ability to reduce painful swelling on injuries. These chemicals turn out to be incredibly important to the sponges, and our long-held views that the glass spicules laced throughout the matrix of the sponge prevented predation (like miniature quills of a porcupine) is simply wrong. Pawlik and colleagues have now clearly demonstrated that fishes will readily accept artificialfoods with higher-than-natural concentrations of spicules incorporated into it, but will reject the same food when the chemicals from the sponge are mixed into it (Chanas and Pawlik 1995; Chanas and Pawlik 1996; Pawlik 1993; Pawlik 1998). Furthermore, there can be extreme variation from individual-to-individual, even within the same species of sponge collected from the same reef (Swearingen and Pawlik 1998). It is difficult to make sweeing generalizations about the habitat requirements of sponges within each species, and there is simply no way to make such generalizations about habitat requirements or defensive capacity of sponges based on their color! Pawlik (1998; 1999) provides a good review of what is known about sponge defenses and the factors limiting their distribution in the wild. I would direct interested readers to these reviews for more information regarding this subject. The final point I want to discuss in this article is the remarkable suite of symbioses common among the sponges. Reefkeepers in general are all familiar with the association of zooxanthellae and corals, but the same appears to be true of sponges. Most marine sponges have symbiotic bacteria (primarily Pseudomonas and Aeromonas ), and in some Verongid sponges, bacteria can account for about 40% of the body weight on average (Brusca and Brusca 2003). However, it is not just any bacteria that thrive within the body of these sponges. In fact, there are a variety of new antimicrobial compounds that have been isolated from some of these same sponge species, which suggests that at least some sponges have a highly specific association with the bacteria found within them (Newbold et al. 1999). Sponges are also the only animals known to commonly maintain symbioses with cyanobacteria, and recent work suggests that both bacterial and/or cyanobacterial symbionts are present inthe majority of sponges (Brusca & Brusca 2003). In general, bacterial symbionts are located deep within the sponge, whereas cyanobacteria are typically restricted to living close to the surface where light is readily available. 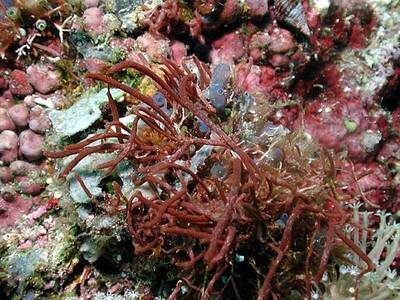 Some sponges have symbiotic dinoflagellates (zoochlorellae), and others maintain symbioses with red algae, filamentous green algae and diatoms. alone on the primary substratum vs. attached to an intact branch of a conspecific or heterospecific sponge. Wulff (1997) demonstrated that these sponges do better when adhering tightly to sponges of other species that differ from them in chemistry, tissue density, and skeletal construction. 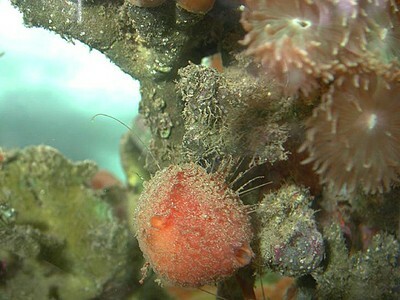 Although the mechanisms by which growth rate is enhanced by adhering to a heterospecific sponge are unknown, Wulff (1997) showed that sponges growing alone tended to succumb to a variety of hazards (including predation by angelfishes and trunkfishes, predation by starfish, smothering by sediment, breakage by storm waves, pulverization by storm waves, toppling by storm waves, fragment mortality, and pathogens), whereas those growing on the surface of another species more often survived. Little is known about such effects in other species or among sponges in captive reefs, but these results suggest that some sponges may survive better in captivity when maintained together than in isolation. On many healthy reefs, sponges are second only to corals in overall biomass, and some have argued that the success of both groups is a function of their ability to benefit from these symbiotic relationships. Many sponges also have numerous small commensals living within their bodies. For example, a single specimen of Spheciospongia vesparium in Florida was found to contain over 16,000 pistol shrimps (Alpheiidae). Another study counted over 100 different species in a 15×15 cm piece of Geodia mesotriaena from the Gulf of California. Such studies are the rule rather than the exception, and most sponges play host to a myriad of other species living within the cavities of their bodies. 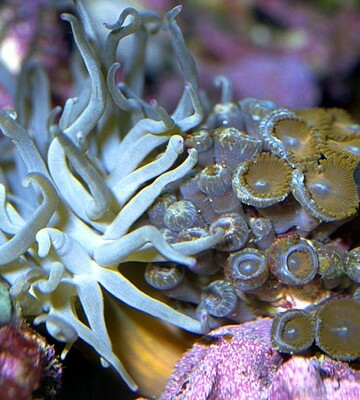 Obviously, the addition of a sponge to your tank is likely to involve considerably more than just the sponge itself. Given the complexity of the associations among sponges and their symbionts and the general lack of concern for or knowledge about their specific biology in the hobby, it is not surprising that results have been highly mixed in keeping these animals in reef aquaria. However, it is becoming ever more common for retailers and hobbyists alike to be careful during the transport and acclimation of these animals to new homes, and with increasing knowledge should come increasing rates of success. Hopefully, with a bit more fore- thought and knowledge about these amazing animals our success rate with sponges will continue to increase in years to come. Becerro, M. A., R. W. Thacker, X. Turon, M. J. Uriz, and V. J. Paul. 2003. Biogeography of sponge chemical ecology: comparisons of tropical and temperate defenses. Oecologia 135:91-101. Brusca, R. C., and G. J. Brusca. 2003. Invertebrates. Sinauer Associates, Inc., Sunderland, MA. Burns, E., I. Ifrach, S. Carmeli, J. R. Pawlik, and M. Ilan. 2003. Comparison of anti-predatory defenses of Red Sea and Caribbean sponges. I. Chemical defense. Marine Ecology-Progress Series 252:105-114. Burns, E., and M. Ilan. 2003. Comparison of anti-predatory defenses of Red Sea and Caribbean sponges. II. Physical defense. Marine Ecology-Progress Series 252:115-123. Chanas, B., and J. R. Pawlik. 1995. 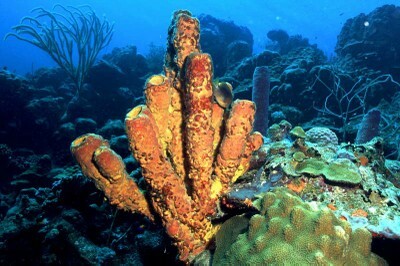 Defenses of Caribbean sponges against predatory reef fish. II. Spicules, tissue toughness, and nutritional quality. Marine Ecology Progress Series 127:195-211. Chanas, B., and J. R. Pawlik. 1996. Does the skeleton of a sponge provide a defense against predatory reef fish? Oecologia (Berlin) 107:225-231. Chanas, B., and J. R. Pawlik. 1999. Do Caribbean sponges have physical defenses? Memoirs of the Queensland Museum 44:92. Dunlap, M., and J. R. Pawlik. 1996. Video-monitored predation by Caribbean reef fishes on an array of mangrove and reef sponges. Marine Biology (Berlin) 126:117-123. Haywood, M., and S. Wells. 1989. The Manual of Marine Invertebrates. Tetra Press, Morris Plains, NJ. Moe, M. 1992. 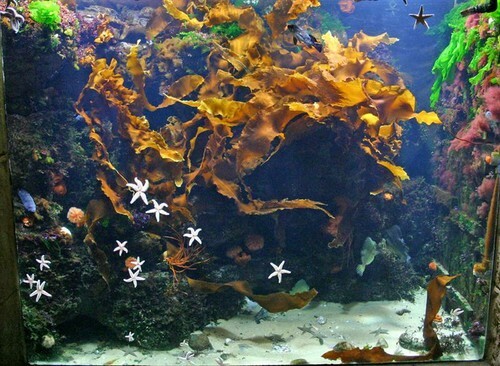 The Marine Aquarium Reference: Systems and Invertebrates. Green Turtle Publications, Plantation, FL. Newbold, R. W., P. R. Jensen, W. Fenical, and J. R. Pawlik. 1999. Antimicrobial activity of Caribbean sponge extracts. Aquatic Microbial Ecology 19:279-284. Pawlik, J. R. 1993. The role of spicules in defending Caribbean sponges from predation: Glass just doesn’t cut it. American Zoologist 33:22A. Pawlik, J. R. 1998. Coral reef sponges: Do predatory fishes affect their distribution? Limnology and Oceanography 43:1396-1399. Pawlik, J. R. 1999. Predation on Caribbean sponges: The importance of chemical defenses. Memoirs of the Queensland Museum 44:426. Pawlik, J. R., B. Chanas, R. J. Toonen, and W. Fenical. 1995. 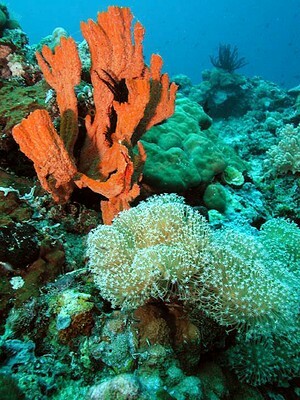 Defenses of Caribbean sponges against predatory reef fish. I. Chemical deterrency. Marine Ecology Progress Series 127:183-194. Reiswig, H. M. 1975. Bacteria as food for temperate-water sponges. Canadian Journal of Zoology 53:582-589. Swearingen, D. C., and J. R. Pawlik. 1998. Variability in the chemical defense of the sponge Chondrilla nucula against predatory reef fishes. Marine Biology (Berlin) 131:619-627. Tyree, S. 2003. The Porifera (Living Sponges): Their Biology, Physiology and Natural Filter Integration. Dynamic Ecomorphology, Rancho Cucamonga, CA. Vacelet, J. 1985. Coralline sponges and the evolution of the Porifera. Pp. 1-13 in S. C. e. a. Morris, ed. The Origins and Relationships of Lower Invertebrates. Syst. Assoc. Special Vol., Oxford, UK. Vacelet, J., and N. Boury-Esnault. 1995. Carnivorous sponges. Nature 373:333-335. Wilkinson, C. R. 1983. Net primary productivity in coral reef sponges. Science 219:410-412. Wilkinson, C. R., and J. Vacelet. 1979. Transplantation of marine sponges to different conditions of light and current. Journal of Experimental Marine Biology and Ecology 37:91-104. Wulff, J. 1995. Sponge-feeding by the Caribbean starfish Oreaster reticulatus. Marine Biology 123:313-325. Wulff, J. 1997. Mutualisms among species of coral reef sponges. Ecology 78:146-159.